As we all know, there are so many fun seasonal things to use this time of year! 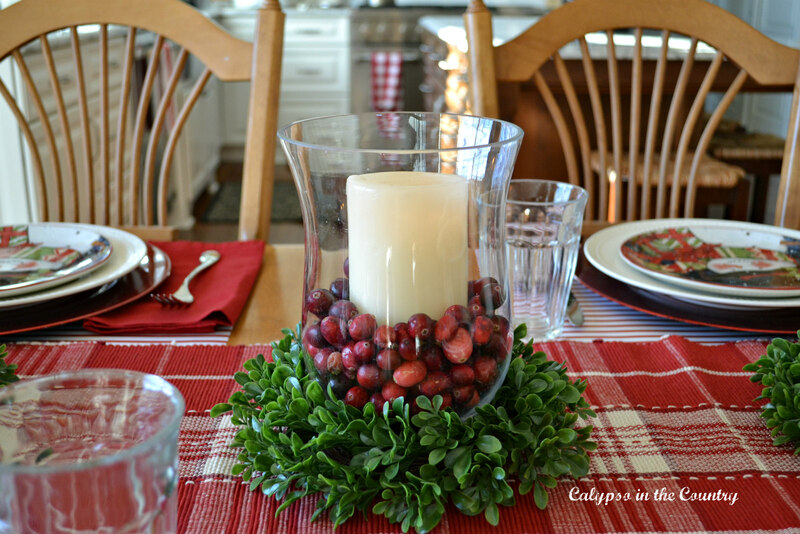 For instance, a hurricane filled with fresh cranberries makes a quick and easy centerpiece. Sit the whole thing in a wreath and you are set. Also, I like to use unscented candles on my table. Even though I love holiday scented candles around my house, the unscented ones are better around food. 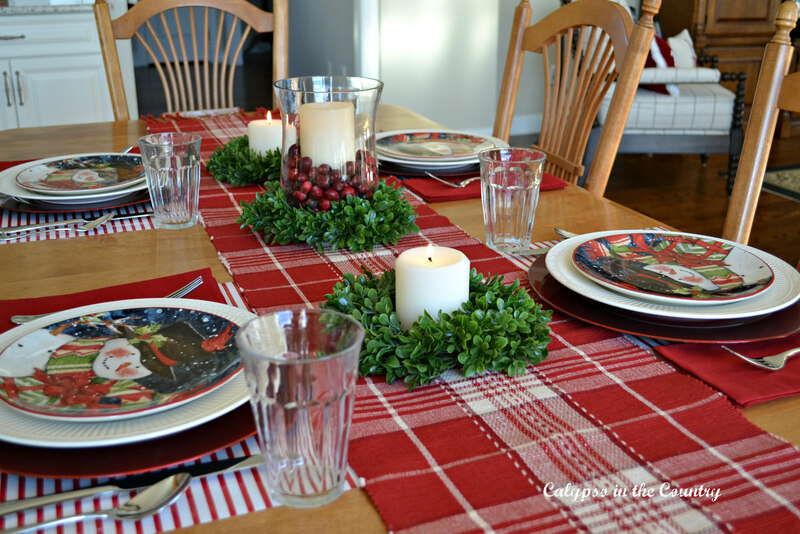 Adding holiday salad plates on top of simple white plates makes the table instantly festive! These snowman plates have been a part of my collection for a couple years. I think I bought them at Wegman’s Supermarket. It’s much less expensive to purchase a bunch of salad sized plates than the larger ones too. 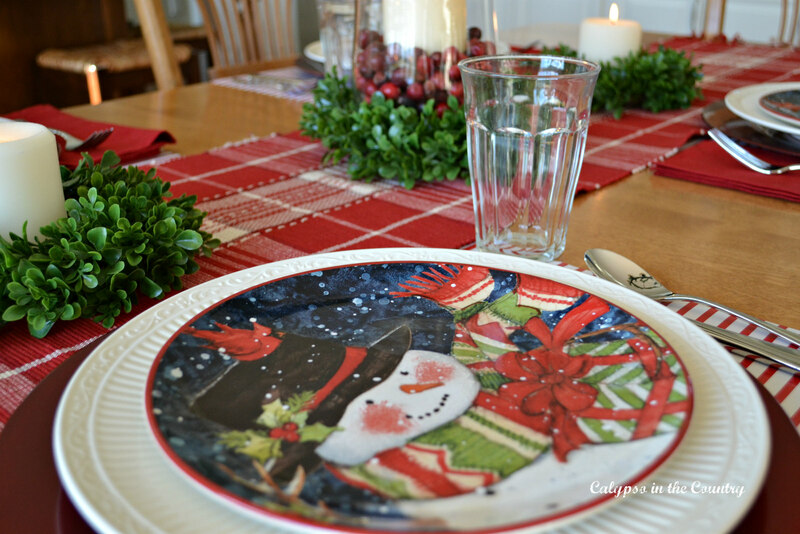 Not only do they add that festive touch buy they great to layer over the plain white plates. It doesn’t have to be expensive to be festive and fun. Look closely and you will see that I even cut up some wrapping paper to make some quick place mats. In addition to these “place mats”, I have used wrapping paper in several other ways to decorate for Christmas. Why spend extra money when you don’t have to, right? Red accessories really stand out in a white kitchen. 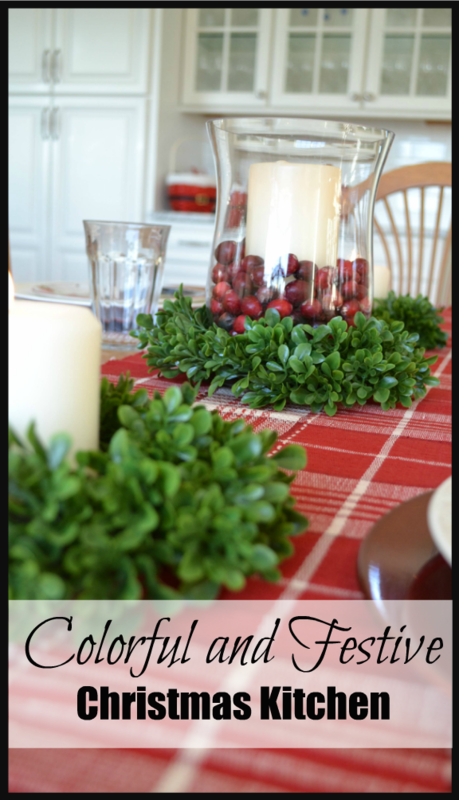 An inexpensive plaid runner adds more color on the table. 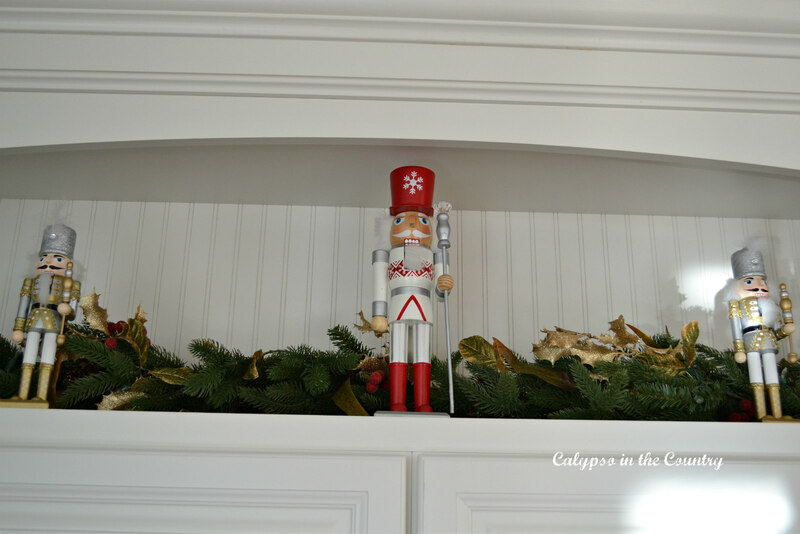 As you can see in the background, I hung mini wreaths on the top glass doors on my cabinets using red ribbon. 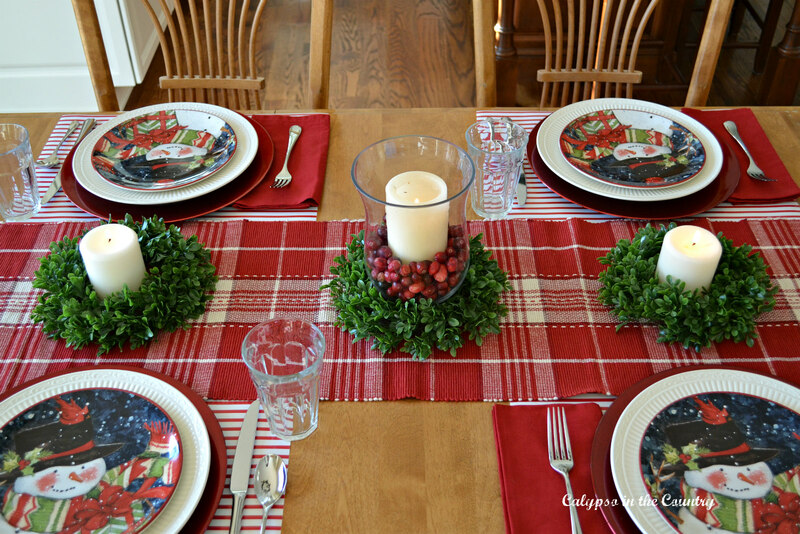 More mini wreaths with candles complete the center of the table. 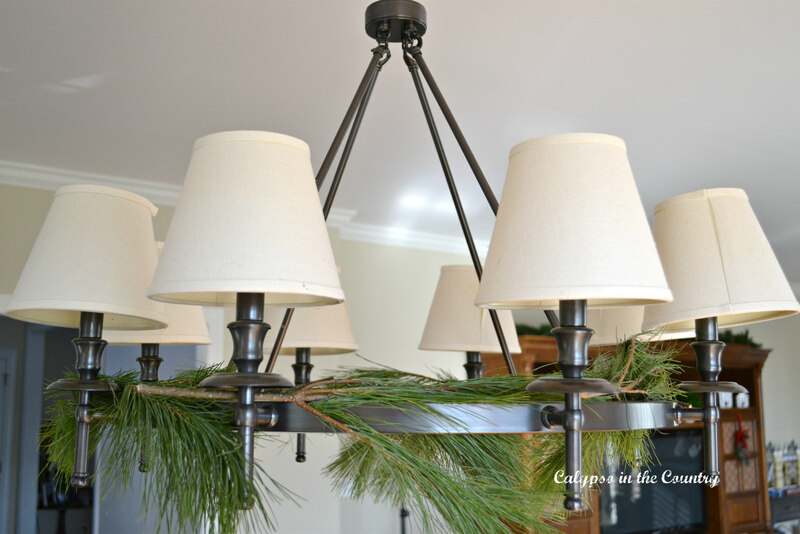 Fresh greens always look pretty and festive on a chandelier. This year, I searched for some pretty faux greens to see if I could duplicate the look. Unfortunately, I couldn’t find any faux ones that I was happy with…so I went with fresh again. I hope they last a few more weeks! If you have found any nice looking faux greens that you recommend, please leave me the info in the comment section! 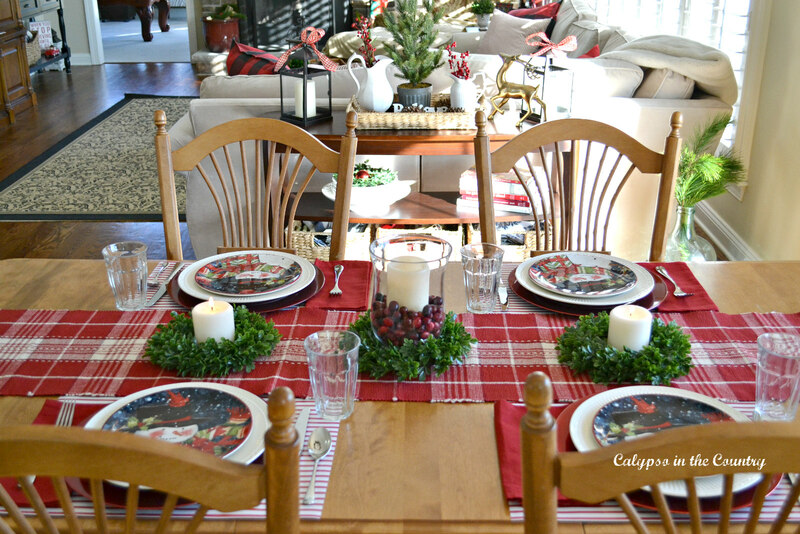 I left the table setting for last night’s dinner but I might recreate it again for Christmas morning. It’s nice and casual for breakfast and very kid-friendly. 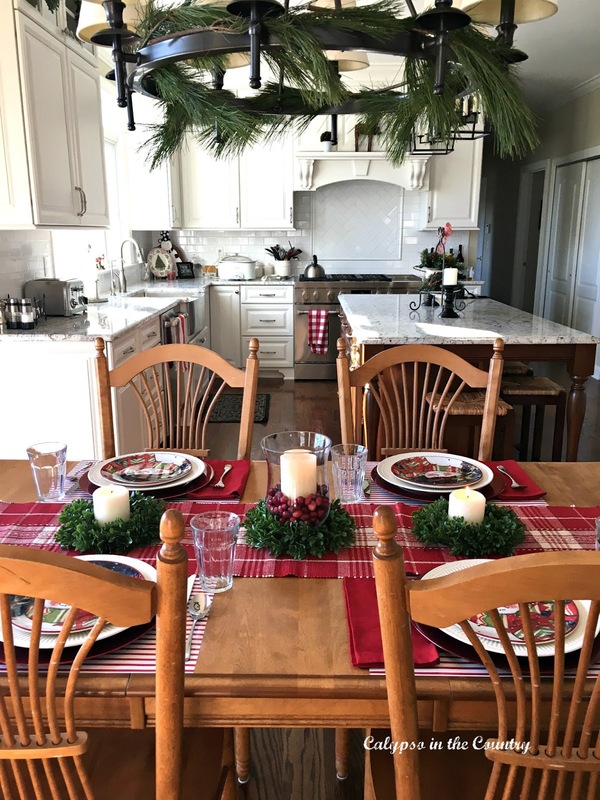 My boys actually love it when the table is all set for Christmas breakfast. And you can’t go wrong with red at Christmas! 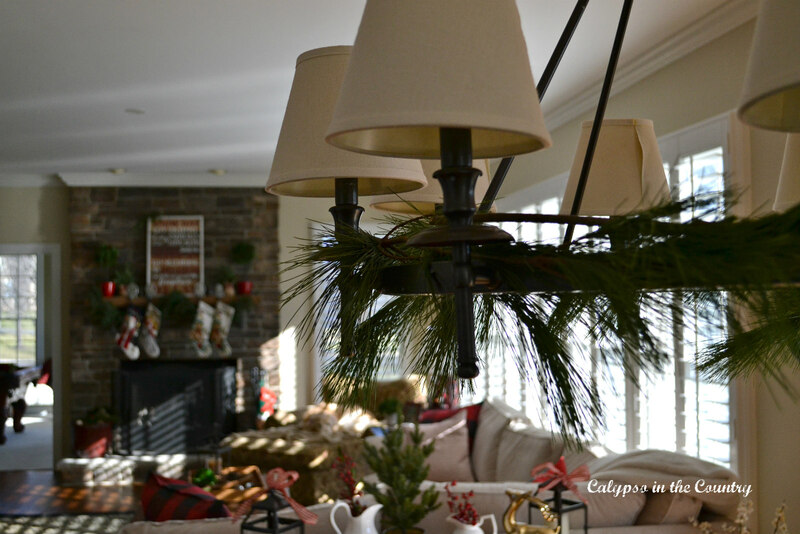 From the table, this is the view into my family room where you can see my latest mantel decor. From the console table, you can look back into the kitchen. Here is a close up of the wreaths I mentioned. To repeat the snowman theme from the table, I included another snowman in a simple corner vignette. 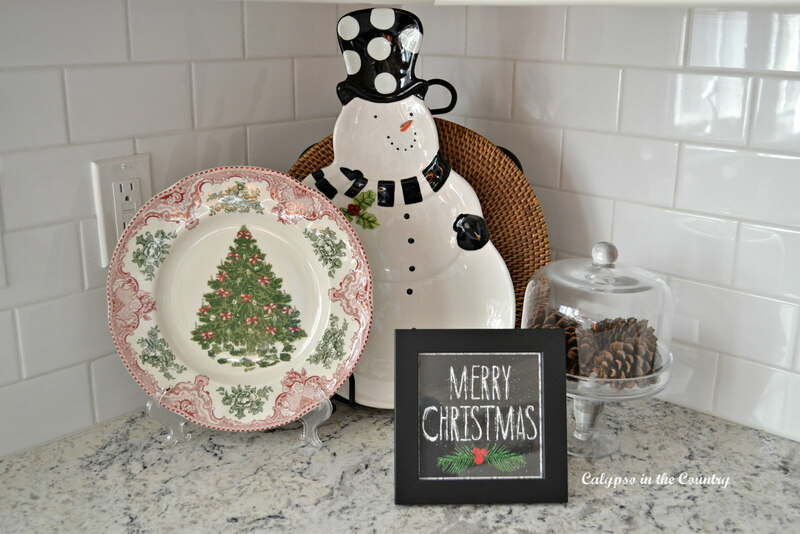 The snowman plate is always a big hit when it’s stacked up with Christmas cookies. My neighbor has a cookie exchange party every year and I always bring the snowman along. 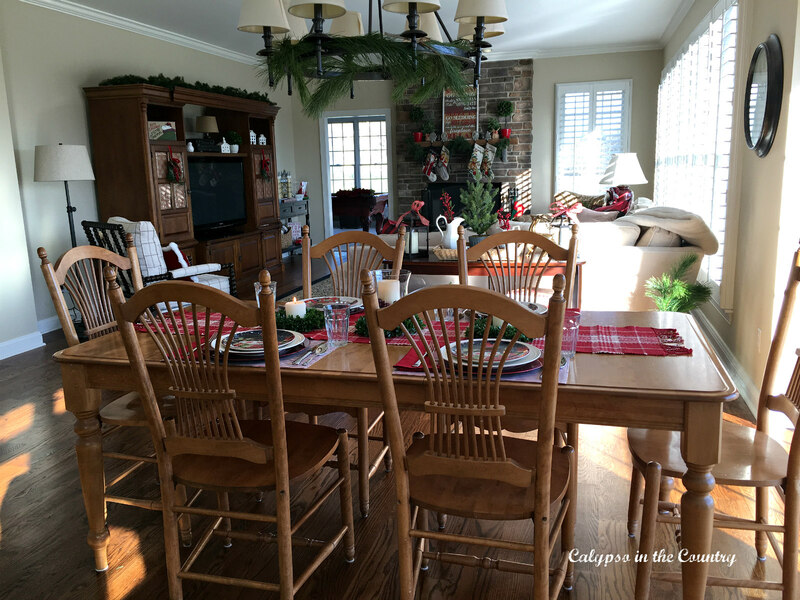 Thanks for stopping by to see my table and kitchen all decorated for Christmas! 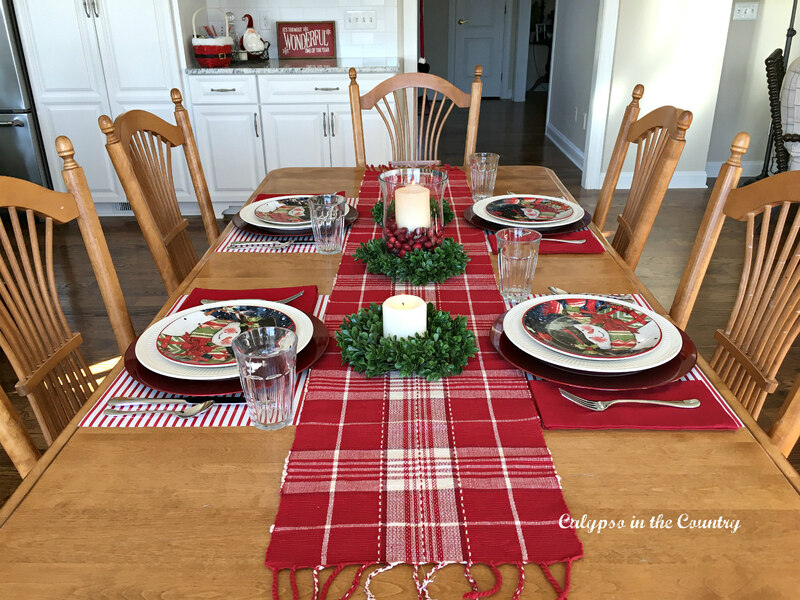 If you are looking for more Christmas Table inspiration, I did a Simple Christmas Breakfast Table Setting that you might want to check out. I am still working on a few things and in a couple days we will pick up our live tree! I have provided sources below for your convenience. Please note that this post contains some affiliate links and I will receive a small commission if you make a purchase after clicking my links. 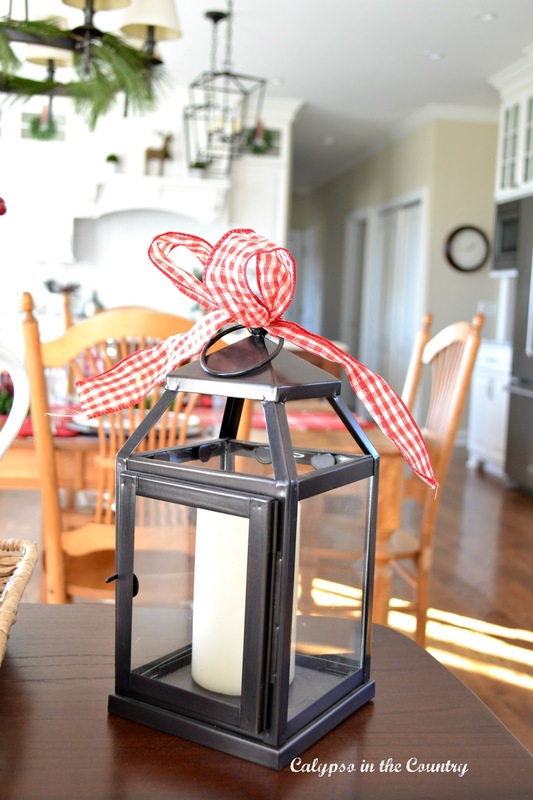 Table Runner – Homegoods and this adorable red buffalo check one would work too! Are you finished decorating yet? 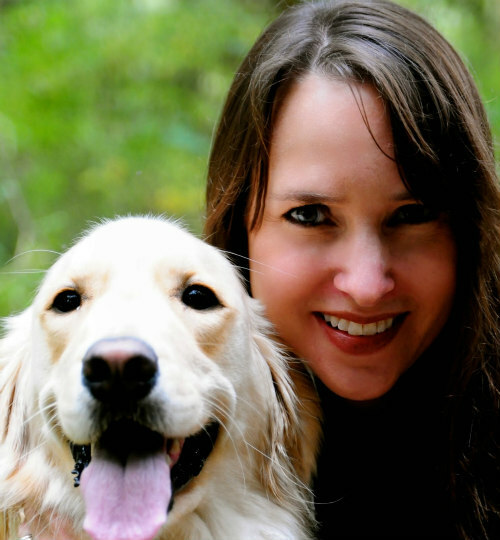 I’d love for you to follow, along so you don’t miss a post! I love the red in your kitchen, too. Traditional is always good! Thanks, Sheila! Boxwoods are so hard to find in that size! Merry Christmas! It looks so pretty. I love the red. 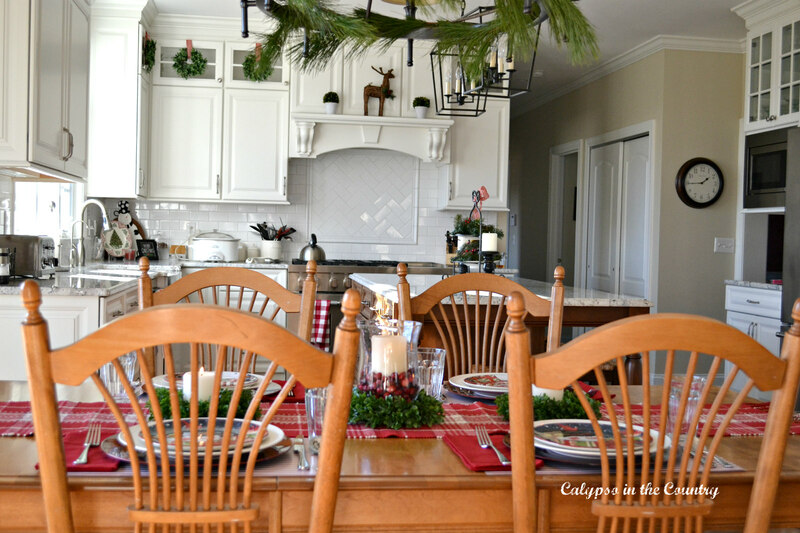 What a fun and festive kitchen table and kitchen! So cute, those snowmen. I think I am done decorating, but the next visit to the thrift store could change that, LOL!! Thank you! Yeah, those thrift stores can be dangerous! Thank you! What a sweet comment, Kari! 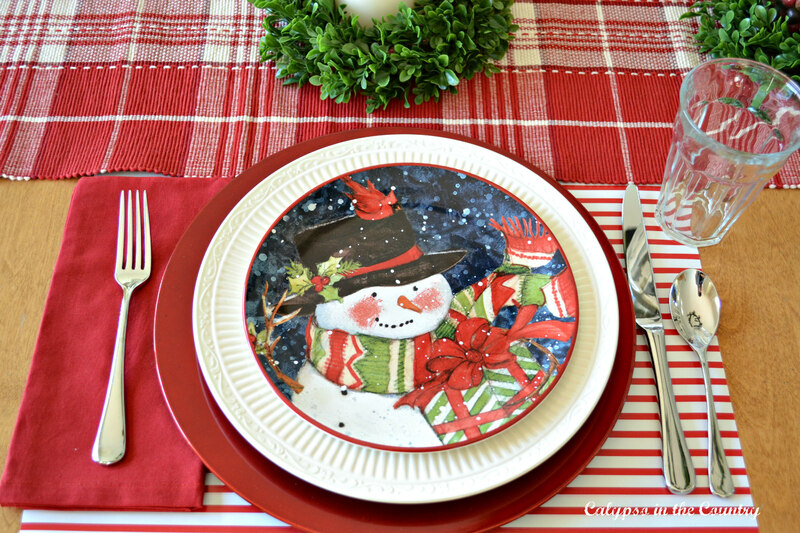 Love the fun snowman plates and the red looks like Christmas to me. Perfect and so pretty. I adore your kitchen as you know. Thanks, Marty! You always say the nicest things! I love the simplicity of your kitchen and table! And red. Love red. 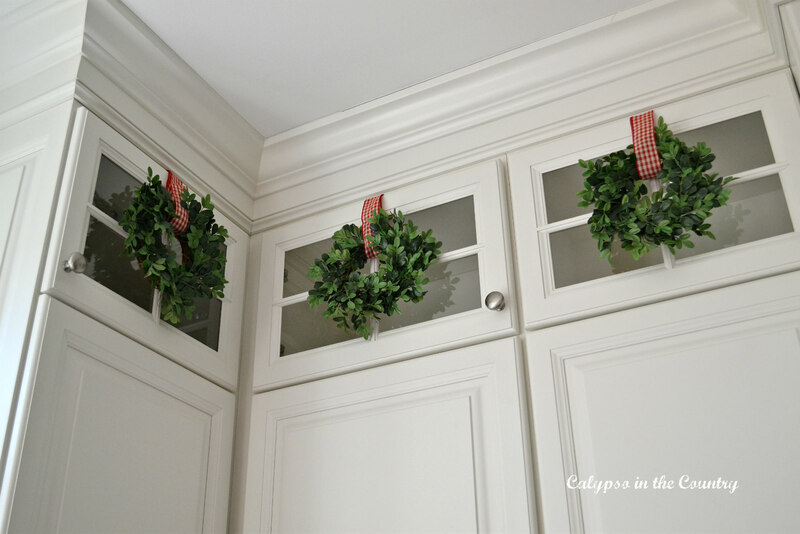 Question: how do you attach the wreaths to the cabinet doors? Any kind of special hook or holder? Thank you for sharing! Thank you! I actually use small Command hooks on the back of the doors. I hang them upside down and cut a small hole in the ribbon to attach it. I will show it in the next post so you can see what I mean. I leave the hooks up all year so I don't have to redo them. Hope that helps! Shelley… your house looks positively gorgeous! I love every festive detail. Enjoy your week. Lindas imagens. A mesa ficou um encanto. Bom fim de semana. Oh, your home looks so festive and warm dressed up for the holidays. I love the light streaming through all your big windows, too. Your entire blog is looking fantastic, Shelley. Merry Christmas to you and your family! I LOVE all of your decorating choice…for ALL seasons! And I really love your kitchen table and chairs! I know from your previous posts that you have had it for a while, but it is exactly the style I am searching for my kitchen! Can you share the name of the manufacturer, and the name of the collection?Thanks and Happy Holidays!! Beautiful table! I know your boys loved it!